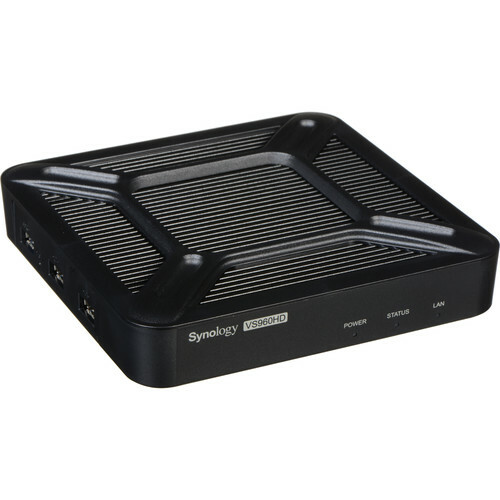 The VS960HD VisualStation Surveillance Station from Synology allows you to connect up to two displays and supports up to 96 IP cameras and 4K UHD resolution. This device connects to a router via its RJ45 Ethernet port, and pairs with your Synology NAS running Surveillance Station 8.0.2 or above, enabling you to monitor and control your IP cameras without a computer. Connect a mouse, keyboard, or joystick to the USB 2.0 ports for complete control, including PTZ control. Via the USB 3.0 port, recordings and snapshots can be stored on a USB drive, which are available for purchase separately. This device supports H.264, H.265, MPEG-4, and MJPEG codecs for high-quality playback. It has no mechanical moving parts, so it is resistant against vibration and hardware failure. It comes with an RJ45 LAN cable to connect to your router and a VESA mounting kit which enables the device to be mounted on a wall or on the back of a screen. Box Dimensions (LxWxH) 10.3 x 7.5 x 1.85"